According to the Half Man Half Biscuit song, life would have worked out better if you’d been the kid at school with the Scaletrix, Subutteo set and a sports shop owning Uncle who could secure you a Dulka Prague away shirt. I was rubbish at Subutteo as a kid and never wanted a Dulka Prague away kit, whilst admittedly the badge is smart, it’s yellow and red combination looks far too much like an Arsenal away shirt for my liking. Anyway, I digress. It may be unfair to Dulka Prague fans to say they were more famous for their away kit than anything else. They have after all won 11 League Titles and reached the European Cup semi-final in 1967 and the Cup Winners Cup semi-final in 1986. However, technically, the team that plays as FK Dulka Prague now is not the legal successor to the team which won all those trophies. That team is called FK Pibram who merged with the previous Dulka Prague in 1996. The break-up of the Soviet Union wasn’t kind to Dulka. They had traditionally been backed by the Army and once this stopped in 1994 they found themselves facing hard-times and forced to merge. So the famous away kit of Dulka disappeared for a few years (Pibram’s is all black which could be cool but is covered in adverts) and the Dulka disappeared from the Prague football scene. 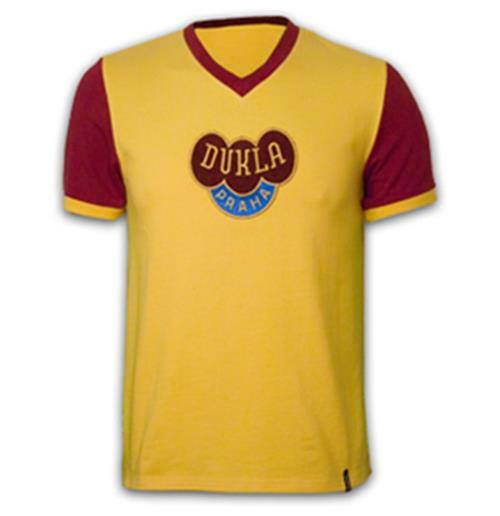 However another local team Dukla Dejvice, began playing in the old Juliska stadium and changed their colours to the famous Yellow & Red. They were playing in the Prague local leagues at the time but in November 2006 they announced that they had agreed to take-over Jakubčovice Fotbal’s place in the Chzeck second division. I presume this was down to financial difficulties as Jakubčovice are now mid-table in the 7th division. This story was pretty confusing for an English football fan as it sounded like a team that was good in the 50’s and 60’s, say Wolves had merged with Walsall who took their place in the top league. A few years later Rushall Olympic change their name to Wolves and eventually take over Birmingham City’s place in the Championship changing their name back to Wanderers of Wolverhampton while the Walsall Wolverhampton Wanderers have got relegated and changed their name back to just Walsall. Still, Dulka have a relatively simple history to explain compared to their rivals on the night Bohemians 1905. A team who have had no less than 15 names since they were founded in 1905 as AFK Vršovice and has at least 2 teams claiming to be the real Bohemians of Prague. I’ll try to keep this brief; AFK Vršovice was part of a much bigger sports club when it was founded called TJ Bohemians Praha, this was a collective of 25 different sports clubs from across the city. In 1993, the football club broke away from TJ to become a separate legal entity FC Bohemians 1905. They kept their place in the Czech football pyramid but TJ claimed they owned the logo and colours of the team. In 2005, FC Bohemians 1905 had severe financial difficulties and TJ Bohemians took advantage of the situation and rented out the Bohemians logo to FC Střížkov Praha 9, a lowly team in the third tier of Czech football. TJ were able to pour money into the new Bohemians Praha and help them rise to the first division. The fans were as you can imagine unhappy about this and refused to take their support across to the new club. They formed their own team keeping the name Bohemians 1905. As a well-supported team they rose up the league until they eventually came to be in the same league as Bohemians Praha in 2010. This story has a happy ending, Bohemians Praha refused to play the game and were fined and deducted 20 points. They were then relegated to the 3rd division for failing to pay the fine. In September 2012 a Czech court ruled that the club must not continue to use the name Bohemians after 31 January 2013 as they had no connection to the historic club. This is still being appealed as we speak. For a more detailed understanding of the history, have a look here. The Julslika stadium where FK Dulka Prague play is a massive stadium with one main stand and a running track so you a pretty far from the pitch. Before the game I found a decent enough bar on the corner of Pod Juslika (the road up to the ground) with fans of both teams drinking and a good selection of Pilsner and food. There were plenty of Bohemians 1905 fans in colours so I guess there is not a history of violence between the 2 teams. Tickets were available to buy at the gate for both the home and away fans so I chose the away end as I’d liked the sound of the Bohemians 1905 fans from what I had read about them previously and the atmosphere is usually better in the away end. This did mean climbing a massive hill from the home turnstiles, outside the away end was Bohemians mobile club shop which was pretty unusual I though for the away team to sell merchandise outside a rivals ground. Inside the ground beer and hotdogs could be bought from a small bar on the edge of the segregation. Another surprise here as the beer was being sold in branded Bohemians glasses. A nice souvenir I thought and made up a little for the poor tasting beer. They also had a handy clip on them which enabled you to carry 3 or 4 beers back at a time and excellent invention that I will definitely copy should I ever open a bar. The Bohemians 1905 fans were a lively bunch and filled most of the away end and also had a group of fans across the segregation in the home end. The FK Dulka fans were more spread out and didn’t really make much noise apart from when they scored the first goal. Bohemian’s fans supported their team well through the game and had a decent song book. They equalised in the second half which brought a pretty decent goon and meant that both sets of fans left the game at least partially happy.